Dementia vs Alzheimer's: What Is The Difference? Difference between Alzheimer’s and Other Types of Dementia? Dementia is a syndrome; Alzheimer’s is a disease. Alzheimer’s is just one type of dementia (the most common type). 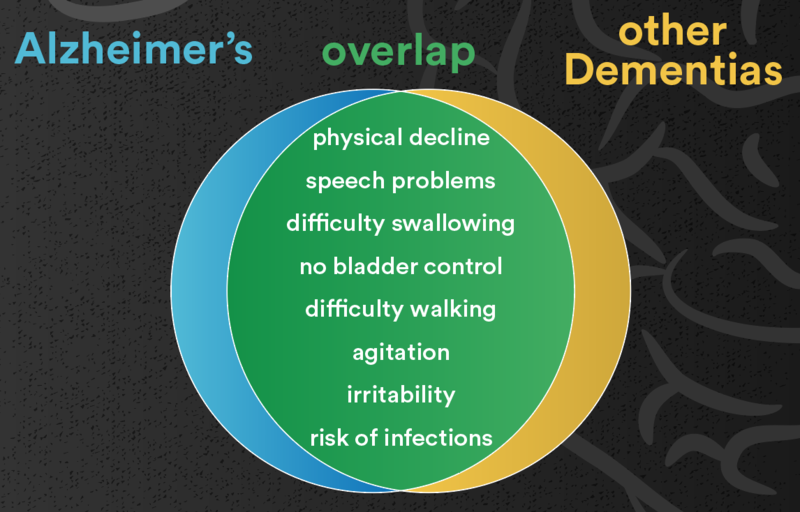 The symptoms of Alzheimer’s and other dementias have significant overlaps. Dementia can have several causes and is potentially reversible; Alzheimer’s cause is unknown and there is no cure. Dementia and Alzheimer’s progress in three stages: Mild (early-stage), Moderate (middle-stage), and Severe (late-stage). Treatments of various types of dementia and Alzheimer’s are similar and have the same goals. The life expectancy of people with dementia depends on the type of dementia; the life expectancy of people with Alzheimer’s depends on their age and genetic composition. There are stark differences between Alzheimer’s and dementia. Whereas a person with dementia need not have Alzheimer’s, a person with Alzheimer’s is by definition with dementia, and Alzheimer’s is notably the most common of many types of dementias. Dementia is a term that describes several progressive diseases of the mind. The term “dementia”, in times past referred to as senility, derives from the Latin demens, meaning “out of one’s mind”. It is a syndrome, a term that describes several chronic and progressive brain diseases, of which Alzheimer’s is the most prevalent. It is important to acknowledge that using the word “demented” to describe a person with Alzheimer’s or another form of dementia is discouraged, for it has negative connotations associated with craziness and madness. Dementia is a disease – thus a person who has it is not “demented,” but rather a person with dementia. Dementia is also used as an umbrella term to designate a number of symptoms related to a gradual degeneration in memory and at least one other cognitive faculty severe enough to cause malfunctions in a person’s ability to carry out their activities of daily living (ADLs). Alzheimer’s is a degenerative disease of the brain that gradually impacts the person’s memory and causes confusion, disorientation, other thought processes, and problems in communicating. Alzheimer’s is a fatal disease that over time affects all parts of the brain. 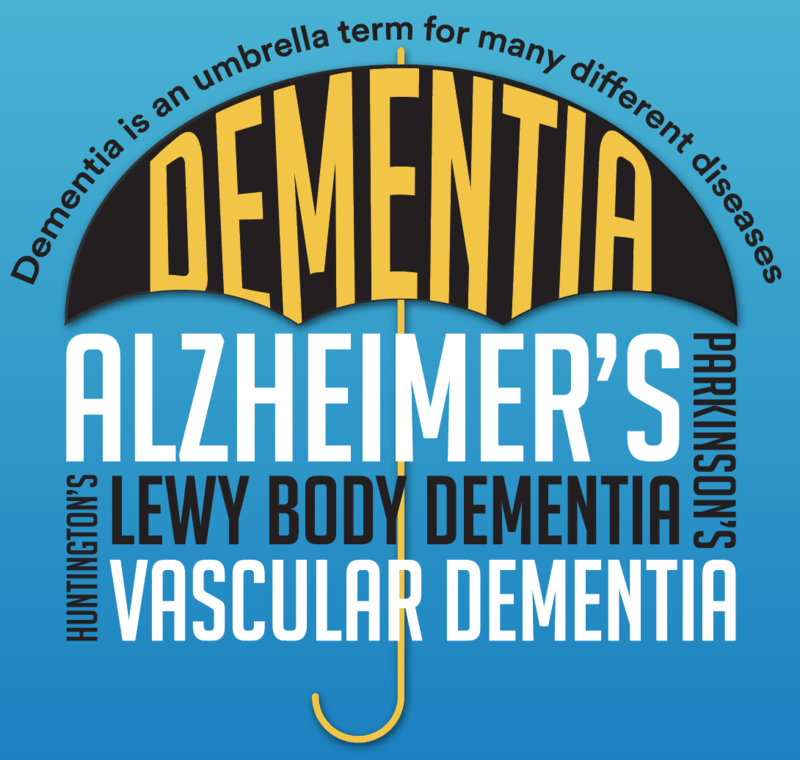 Dementia is a syndrome or simply an umbrella term for different diseases, whereas Alzheimer’s is a specific type of dementia with its own set of symptoms, stages and types. According to the National Institute on Aging (NIA), dementia is a brain disorder that impacts a patient’s ability to perform activities of daily living, while Alzheimer’s is a regressive and irreversible type of dementia that impacts sectors in the brain that affect memory, thought, and language. A main difference between Alzheimer’s disease and dementia is that Alzheimer’s is degenerative and incurable, whereas certain types of dementia, such as dementias caused by certain thyroid conditions, reactions to medication or deficiencies in vitamins and minerals, can be reversed or are merely temporary. It is also worth noting that neither dementia nor Alzheimer’s disease are part of the normal aging process. Although memory loss is the one factor that is predominantly associated with both dementia and Alzheimer’s disease, one can experience memory loss without having Alzheimer’s disease or dementia. In addition, “probable AD” is a term used by physicians who specialize in dementia and Alzheimer’s disease to specify that based on the symptoms and progression of the disease, it is pathologically likely that the patient has Alzheimer’s. Cognitive symptoms of dementia typically include memory loss, confusion, loss of visual and spatial skills, and difficulties articulating thoughts. Behavioral symptoms can include crankiness, mood changes, agitation, lack of self-control, poor judgement, and wandering. Psychological symptoms may include restlessness, withdrawal, mood swings, depression, hallucinations, paranoia and delusions. Alzheimer’s manifests itself differently in each person. There is a saying that if you’ve met one person with Alzheimer’s disease, you’ve met one person with Alzheimer’s disase. However, in the early stages, common symptoms of Alzheimer’s include memory loss, difficulties handling money and making judgments, losing things, stashing items in odd places, and language issues. In the middle stages, people with Alzheimer’s begin to have more trouble articulating words and sentences, increased memory issues, verbal and behavioral repetition, wandering, hallucinations, and paranoia. In the advanced stages, people with Alzheimer’s typically lose the ability to communicate, experience incontinence and sleeplessness, seizures, and difficulty swallowing. What is the Difference between Alzheimer’s and Other Dementia Symptoms? 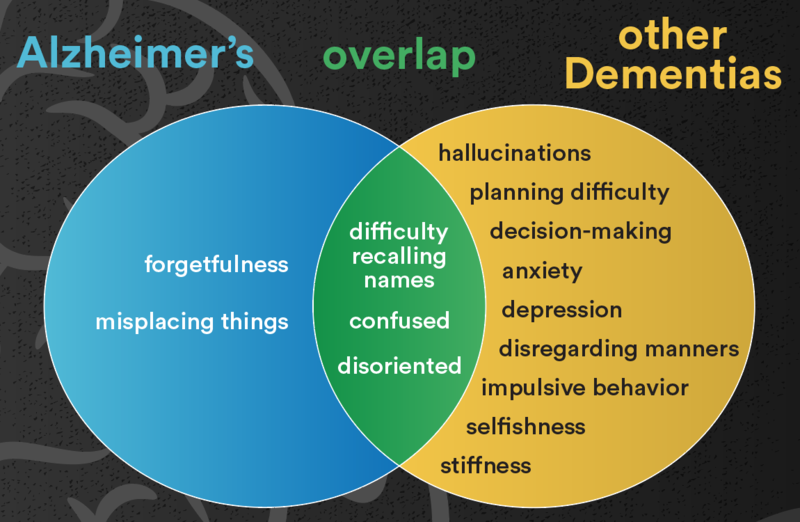 There is a significant overlap between the symptoms of Alzheimer’s and the symptoms of other types of dementia, particularly in the early stages of Alzheimer’s where there is a loss of memory, a falling-off in the ability to think, and the beginning signs of communication problems. When the underlying disease is Parkinson’s or Huntington’s, people with dementia are also prone to involuntary muscle movement or motor difficulties in the early stages, whereas people with Lewy Body Dementia (LBD) are likely to experience acute sleeplessness, difficulties with balance, and vivid hallucinations. Dementia occurs when nerve cells in one or more parts of the brain are damaged, and people with dementia experience different symptoms depending on the location and severity of the damage in the brain. 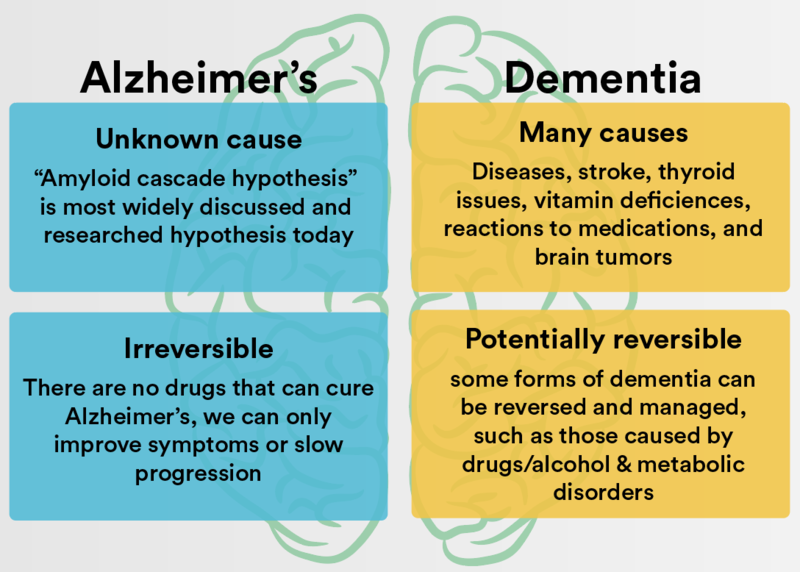 Although some dementias can be successfully treated, as for example dementias that ensue as a reaction to certain medications or because of vitamin or mineral deficiencies, the majority of dementias are degenerative and progressive in nature. Progressive diseases like Alzheimer’s, Parkinson’s and Huntington’s are the prime causes of dementia. Other causes however can include chronic abuse of drugs or alcohol, infections, most notably HIV, vascular complications, strokes and chronic depression. Alzheimer’s disease accounts for roughly 60% of all dementias, and it also accounts for another 20% of dementias when it occurs in the form of mixed dementia with vascular or other dementias. The main cause of Alzheimer’s disease is traced to a high number of protein deposits from plaques and tangles in the brain, causing connections between nerve cells to weaken and die. In some cases, Alzheimer’s is also known to run genetically in families. Physicians can make a diagnosis of Alzheimer’s disease in 90% of cases, though, officially, Alzheimer’s can only be definitively diagnosed after death in an autopsy. What is the Difference Between Alzheimer’s and Other Dementia Behaviors? When the underlying dementia disease is other than Alzheimer’s, the behavioral changes that the person with dementia experiences can at times differ considerably. For example, a person with sundowner syndrome can get particularly agitated, argumentative and even combative at around the time the sun sets in the late afternoon and early evening. Hallucinations are more frequent and pronounced in Lewy Body patients than in patients with Alzheimer’s, and they occur in earlier stages. The disruptions in cognitive faculties in Lewy Body patients occur more frequently than in Alzheimer’s. Depression is more prevalent in those with LBD. People with LBD experience impaired motor skills, mimicking symptoms of early stage Parkinson’s, at earlier stages than those with Alzheimer’s. Individuals with Parkinson’s frequently develop cognitive impairments in later stages. Some drugs, typically prescribed for agitation or hallucinations, can bring about Parkinson’s-like symptoms in some with LBD. With Lewy Body Dementia, movement difficulties are spontaneous, and the symptoms more sudden, than with Alzheimer’s. Shaking and tremors are more pronounced in Parkinson’s. One out of every two LBD patients exhibits a behavior referred to as “Rapid Eye Movement Sleep Behavior Disorder”, involving intense dreaming, tossing back and forth agitatedly, and talking while asleep, with ensuing drowsiness in the daytime. In addition, people with Frontotemporal dementia (FTD) typically experience more personality changes than those with Alzheimer’s and other types of dementia. For example, they may lose their inhibitions and act improperly in social situations, even in the earlier stages of the disease. In the early stages, many people with dementia can still function independently, including holding jobs, driving, and remaining socially active. Difficulties begin to arise when it comes to balancing a household budget, planning and organizing tasks, and managing medications. Early signs may appear such as misplacing the checkbook, forgetting names, or going into the kitchen to get something and not remembering what that was. The middle stages require an incrementally greater level of care and support. In those stages, repetitive behaviors start setting in, communication becomes all the more difficult, and although patients may still be able to live independently, they require more assistance with their activities of daily living. People with mid-stage dementia often also experience increased memory loss, and sleep pattern disturbances such as sleeping during the day and restlessness at night. The late stages may last for several years or for just a few months, depending mostly on the individual’s physical conditioning, genes, and various other lifestyle factors. Late-stage dementia is marked by behaviors that are out of character, such as increased agitation, continual questioning, pacing, and unusual sleep patterns. People with dementia also eventually lose their ability to communicate, and they become increasingly incontinent and non-ambulatory. Damage to the nerve cells in various parts of the brain commonly occur years before Alzheimer’s symptoms begin to appear. Alzheimer’s clinicians have broken the disease into two models, the first consisting of seven distinct stages, although many of those stages in fact depict only changes in the severity of the decline. Using the second model, the Alzheimer’s Association simplifies the process by enumerating only three stages to Alzheimer’s, namely mild, moderate and severe. Mild Alzheimer’s Disease is not to be mistaken for “early onset Alzheimer’s”, a term used to categorize people who acquire the disease before age 65, i.e. years before Alzheimer’s impacts the majority of people. With mild Alzheimer’s disease, the initial memory loss that occurs is of the type that relates to most recent events and people. Patients with mild Alzheimer’s disease still function with considerable independence, although they start “misplacing” their keys or eyeglasses, and they start getting stuck with words and names in their communications. In this phase of the disease, the earlier symptoms experienced in the mild stage are amplified and become more of a hindrance in the performing of everyday tasks. A further decline in memory, speech, logic, problem-solving and other cognitive factors means that patients in the moderate stage of Alzheimer’s begin to need an increasing amount of help at every level. Challenges to the caregivers of patients with Severe Alzheimer’s Disease reach a highpoint in which total care is required. Severe symptoms include acute muscle weakness, weight loss, appetite suppression, and an inability to swallow. In this severe stage, Alzheimer’s patients may no longer be able to walk, sit up, or hold their head up. Eventually, the ability to swallow, to control bladder and bowel functions, and an increased susceptibility to infections such as urinary tract infections and pneumonia take over. For more detailed info on stages of dementia, click here. Treatment for most dementias, including Alzheimer’s disease, focuses principally at mitigating the harsher aspects of some symptoms and, whenever applicable, at attempting to slow down the progression of the underlying diseases and thereby prolong the person’s life. In that respect, there are no major differences between the treatments of Alzheimer’s and other types of dementia. We noted earlier however that while most types of dementia are progressive and incurable, some dementias can be temporary in nature or reversible. These are dementias that arise from certain thyroid conditions, as well as from reaction to medications and/or vitamin and mineral deficiencies. The treatment of these types of dementia naturally start with prescribing vitamin-rich diets, as well as treating the specific underlying thyroid condition. Similarly, other medical issues such as UTI’s, can go undetected in older adults and lead to dementia-like symptoms and confusion. However, in this case, once treated, cognitive functioning should return back to normal. For all stages of Alzheimer’s, donepezil (brand name Aricept), and rivastigmine (Exelon) are prescribed. These medications are Cholinesterase Inhibitors that boost levels of the chemical messengers in the brain that affect recall and reasoning. They are mostly used in the treatment of Alzheimer’s disease, but they have also been recommended for vascular dementia, Parkinson’s disease dementia, and Lewy body dementia. Galantamine (Razadyne), another cholinesterase inhibitor, is also approved by the Federal Drug Administration (FDA) for use for patients with mild to moderate Alzheimer’s. For the more severe stages of Alzheimer’s, memantine (Namenda) and donepezil (Namzaric) are usually prescribed. Memantine is a chemical messenger that regulates brain tasks, including processing new information and recall. It is important to emphasize that while these treatments provide some individuals with a degree of relief with symptoms and may stall the progression of the disease temporarily, they are not a cure. Alzheimer’s and most other types of dementia are progressive, meaning they will continue to worsen with time. Although stringent FDA testing and guidelines rarely apply to many supplements, some natural remedies and herbals have proved to be beneficial for people with dementia. For example, Omega-3 fatty acids, found in seafood, seem to lower the risks of developing dementia. Eating fish regularly seems to provide a degree of protection, although once Alzheimer’s has set in, Omega-3 fatty acids will likely have little effect. Ginkgo has also been thought to improve memory and is safe to use, although again clinical studies report conflicting results for people with dementia. Coconut oil is under study as well for possibly slowing the pace of progression. The best therapy of course is unconditional love and care, which can be a challenge to both family members and caregivers. Person-centered dementia care enhances the person with dementia’s individuality by aiming to boost uplifting sentiments, nurture what he or she can still do, and further his or her independence. A nutritious diet, good hydration, plenty of sleep, and exercise – research suggests that these are the constituents of a daily routine that can perhaps mitigate the most severe of symptoms and delay the progression of dementia. Exercise, whether going for a walk or doing gentle leg lifts in bed, can be particularly helpful for both individuals with dementia and caregivers. A key component of the health-based approach to dementia care builds on the ability to continue with past social activities and lifelong joys. For example, if in the past, a person used to walk barefoot around the house and in the yard, then they should be permitted to tread barefoot on a sunny day in the back yard. Or if they always enjoyed gardening, try to find ways for them to tend to plants and vegetables. These simple activities can boost self-esteem and alleviate the stress and anxiety that may occur alongside their dementia, and they can help improve quality of life for the individual with dementia and his/her caregiver. Additional therapies that may help include music or pet therapy. Visits from therapy dogs that are empathic and affectionate toward the patient, or even adopting a cat or a dog have been shown to be helpful. Aromatherapy, notably the use botanical oils such as rosemary and lavender oil, can be calming and soothing. Massage therapy often incorporates aromatherapy for its soothing effects and can also ease anxiety. Art therapy such as painting, collage, photography, and clay with emphasis on the method and not the end product can be relaxing as well. Art can provide fun and joy and a sense of purpose, aspects of life that can sometimes feel lacking for people with dementia. The life expectancy of persons with dementia depends to a large extent on the precise dementia they suffer from. For example, while Parkinson’s disease (PD) is not fatal, complications that arise from that disease put the life expectancy of someone with PD at between 10 and 20 years from onset. Lewy Body Dementia (LBD) is much more relentless than other dementias, with a lifespan after onset of only 5 to 7 years. In the case of vascular dementia, although treatment with medications can prolong life, the average survival period from the time of diagnosis is around 4 years, the shortest lifespan among all the dementias. By contrast, although the life expectancy of a person with Alzheimer’s disease depends on several factors such as their age and genetic composition, it is generally thought that on average, a person with Alzheimer’s lives for around ten years from the disease’s onset before succumbing to the disease. 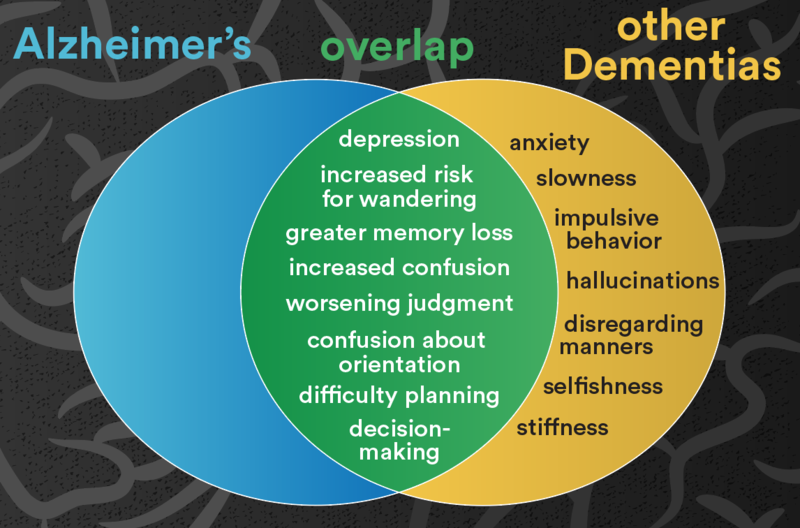 For more details on how Alzheimer’s differs from other specific types of dementia, see our article on Types of Dementia.